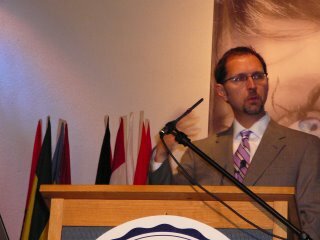 Today I got to speak at the opening assembly of our elementary school. That is always a pleasure. I have some students opening a surprise during my talk. 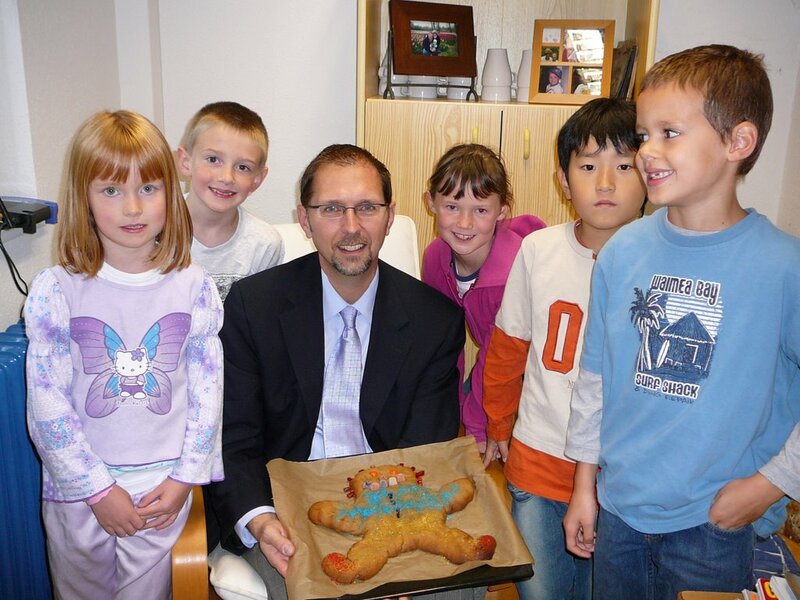 In addition, I got to have a part in the annual first grade "Gingerbread Man chase". Around me are our five first graders. This year at the opening ceremony I told the tragic story of John A. Sutter, the "Kaiser of California". 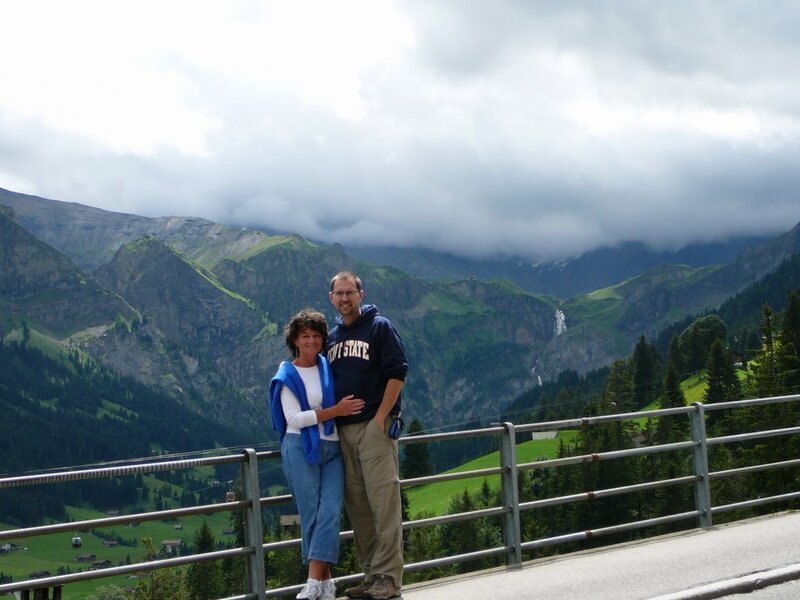 Sutter was born and raised in our town of Kandern, Germany. Later in life he emigrated to California where he became one of the richest men in North America. At the height of his success gold was discovered on his land. This triggered the famous Gold Rush of 1849 and he signaled the end of Sutter's fortune. Sutter lived the remaining years of his life depressed and bitter. This story served as a warning to "not store up treasure on earth where moth and rust destroy and thieves break in an steal". Please notice the banner behind me that Luke designed. 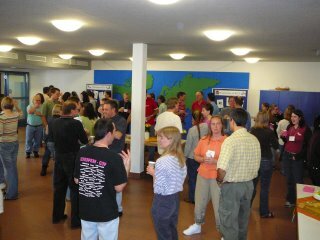 Tuesday, 19 August 2006, first day back at school. Tyler starts 10th grade and Luke starts 12th grade today. Wow. 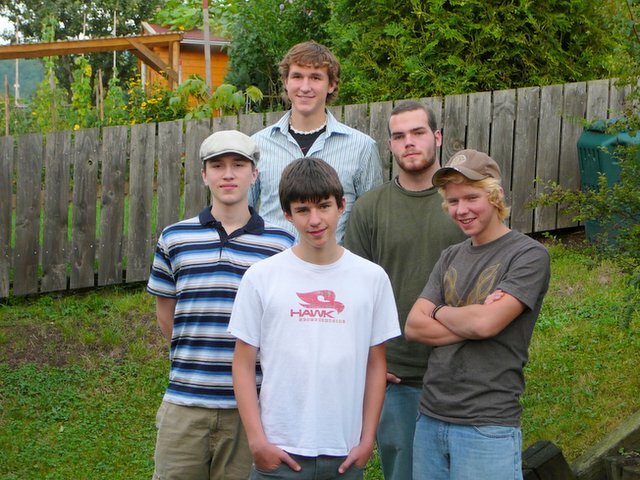 Luke and his friends Billy, Nathan and Timo. 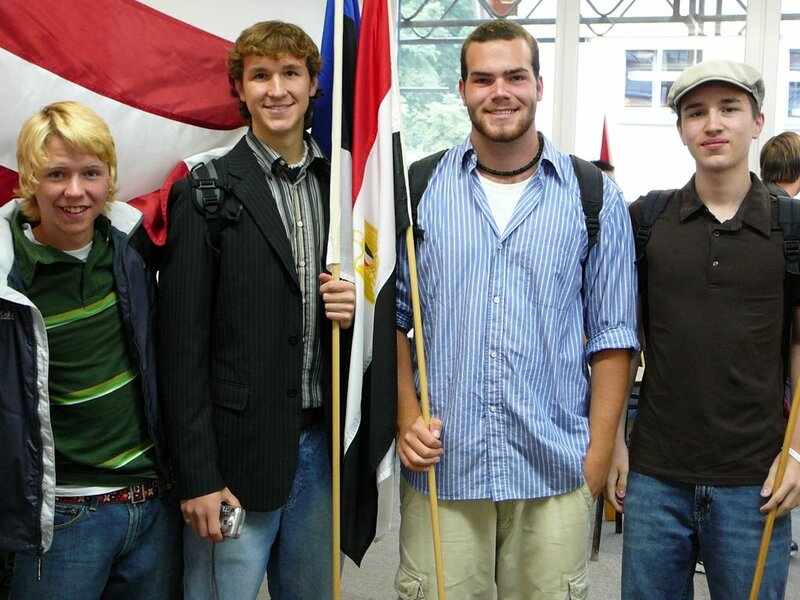 The seniors carry in the flags of the world during our opening ceremony. 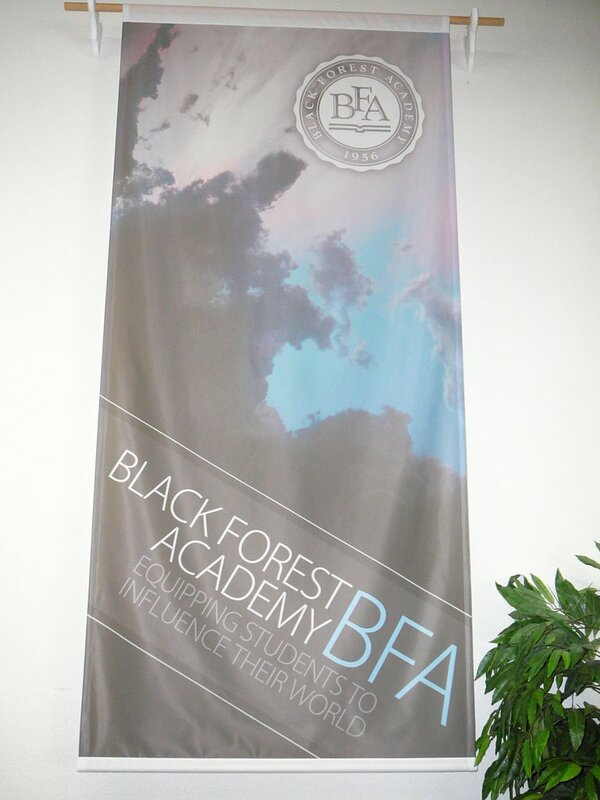 Luke designed these banners for BFA. 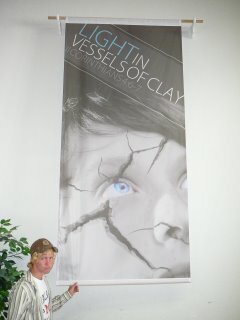 It shows the theme for the school year..."Light in Vessels of Clay" taken from 2 Corinthians 4:6-7. We are a bit disappointed that the banner is somewhat "washed out". 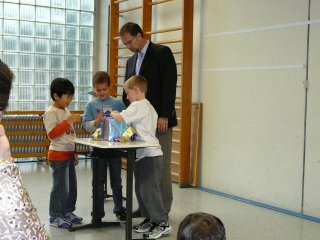 We will go back to the print shop to see if they will correct the coloring. 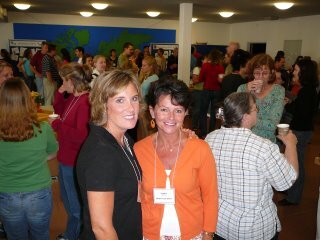 Sandee is visiting with Jen Stemple, a fellow C&MA missionary serving at BFA during a coffee break at Staff Conference. 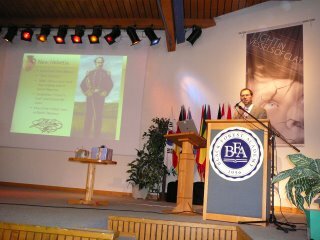 Jen's husband, Sam, is BFA's Chaplain. We had a good group of guys over for supper. 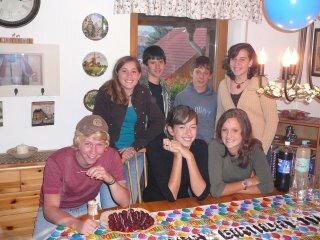 Sandee made a big pile of taco shells for these 8 guys old friends of Luke and Tyler's. 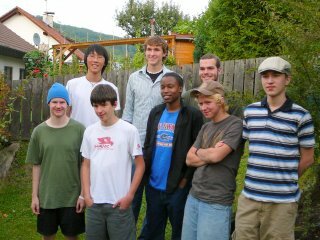 Front row: Adam (parents work in Kazakstan), Tyler, Rouce, Luke, Timo. 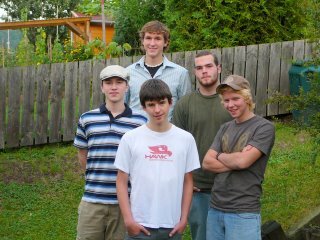 Back Row: Tim Lee (Parents work in Russia), Billy, and Nathan. Look what came by BFA today! 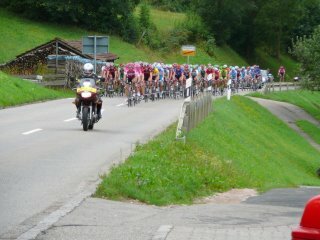 A bike race came through our town right past the front of Black Forest Academy. We don't know what race it was. I can tell you Lance Armstrong was not in this race. 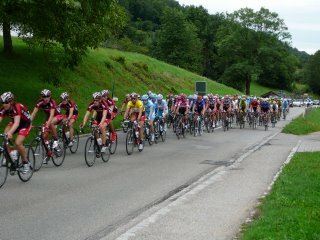 It gave us about 10 minutes distraction and all staff on site came out to watch and cheer. 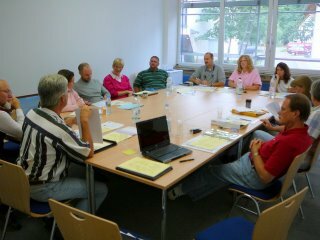 Today we held our first SMT (School Management Team) meeting of the new school year in the new conference room. This is a fine group of leaders in the ministry of Black Forest Academy. 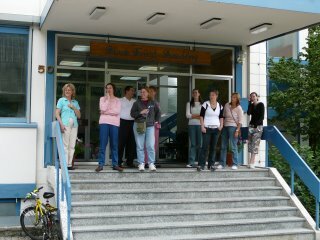 We are discussing many details of the school opening. 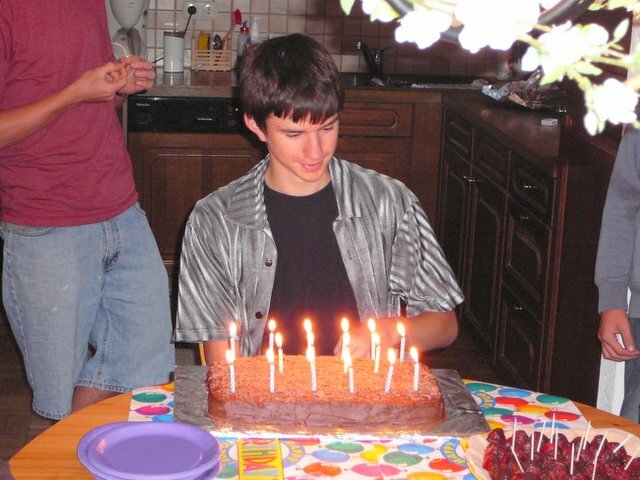 August 14, 2006 Tyler turned 16 today!! We are very proud of this boy of ours. He had some friends over tonight for a little party with cake, and ice cream. Most of his guy friends are gone for various reasons so he invited the girls! 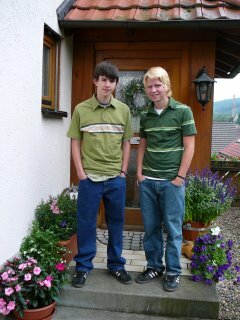 And his friend Tim Hildebrand and his brother Luke, of course. 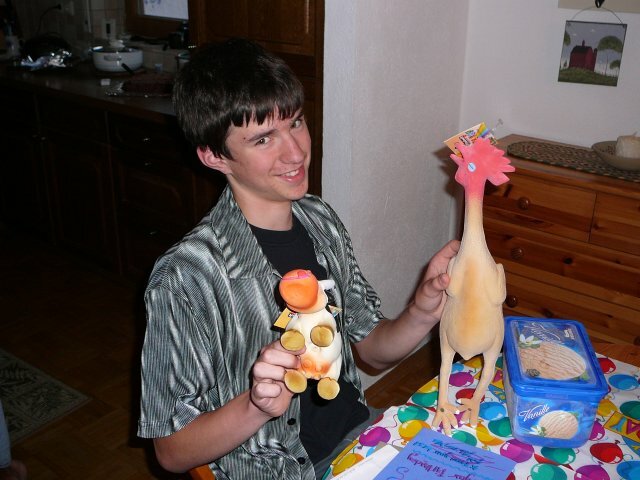 Tyler loves rubber chickens!! Now he has a second one to go with his first one. Is that a rubber cow in his other hand?!? 16 candles really puts out the heat! 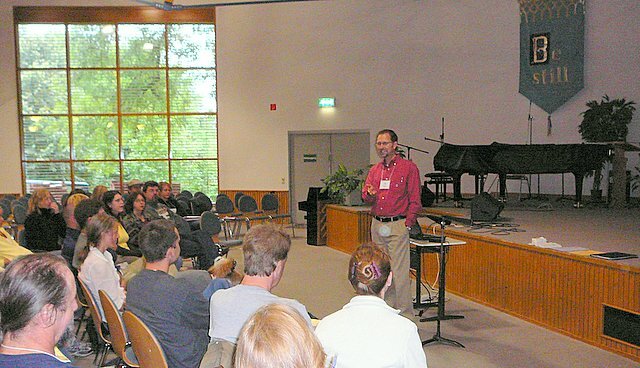 Here's Tim welcoming BFA's newest staff members to Germany. Today we welcome these wonderful people to our team. Just think, only two more weeks to go until the students arrive and school starts again. The new roof is on the Janz Building , BFA's main classroom building. Scroll down to see how it looked just four weeks ago. 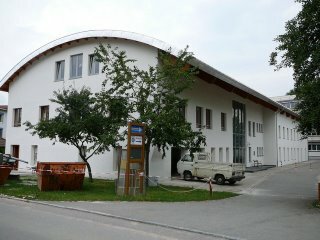 There is still a lot of work to do on the inside, but it will be done on time for school start up. Thank you for your help. 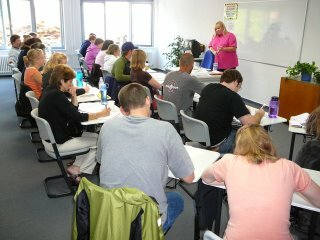 Here are our newest staff members taking a survival German course as they begin their ministry at BFA. Brian Riffe, Ken Salt and me working on one of four classrooms that was damaged by a heavy rainfall in June. We are almost done - today we were working on the ceiling tiles above us. This is our new-used car in front of our house. 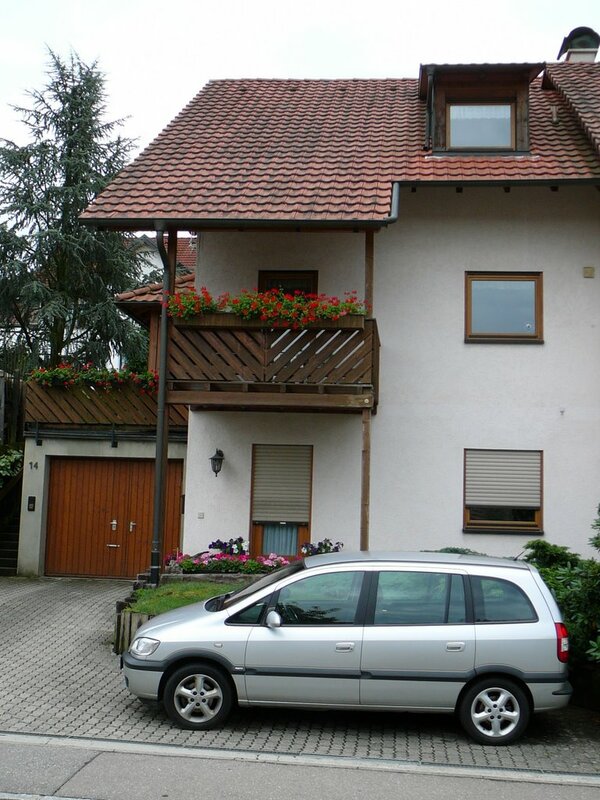 Many of you helped us to get this car - an Opel Zafira. Thank you. Opel is a Made-in-Germany GM product. Silver is a very popular color for cars in Germany. I heard recently that over 40% of cars in Germany are silver.